Hardenhuish is an 11-18 co-educational comprehensive school set in the magnificent parkland of the former Hardenhuish Manor and Chippenham Grammar School. 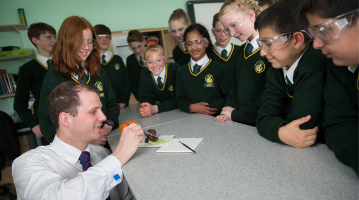 We enjoy and enviable reputation locally and nationally as a high performing academy, being the first school in Wiltshire to take advantage of more local leadership as part of the DfE’s flagship academy scheme. We have three priorities which permeate all that we do. Firstly and perhaps most importantly our aim is for all our young people to be ‘inspired to learn’ – to leave us as independent learners, with the necessary skills for lifelong learning. We provide a purposeful approach to learning, ensuring that this incorporates fun and engagement. Our status as a Microsoft Showcase School puts us at the leading edge of new technologies and we are continually exploring ways to incorporate ICT into lessons in a meaningful way. As Lead School for Gifted and Talented learners in North Wiltshire, we make exemplary provision for our most abel learners. Our second priority is the pastoral care of our young people. We put children at the centre of all we do and believe that a three way partnership with school, home and each child ensures that every individual is ‘supported to succeed’. We look for opportunities to celebrate success through our rewards system, assemblies, weekly ‘Headlines’ and annual celebration events. Hardenhuish has been oversubscribed for several years and this year all of the pupils joining us in Year 7 selected us as first preference – we appreciate the trust that parents have put in us. Finally we aim to ensure that each Hardenhuish pupil not only achieves academic success and the qualifications to take them on to further or higher education and adult working life, but also takes advantage of the wide variety of social, personal and recreational enrichment opportunities that our impressive campus and fantastic staff enable us to offer. 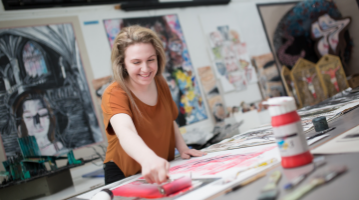 Our site is beautiful and boasts some of the most impressive educational facilities in the County, including a Creative Centre, Sports Hall with climbing wall, English and Performing Arts Centre, a modern Advanced Centre for the 6th Form and Resources Centre.